For the first time in the 41 years since Western closed her doors we have a unique chance to ensure the school's graduates have a permanent memorial in their memory. With your help we will lay a "Western Courtyard" around the flagpole and erect a 12 foot high interpretive obelisk telling the story of WMA and her grads in the garden area adjacent to the front gate. During the last year a team of local Raiders have been working to assure we would have this opportunity. Jim Goodwin '46, Richard Rook '49, Mike Doucleff '63 and CB Jackson '68 have met with the current owners of the property (Faith Baptist Church) and Alton city officials to get us to this point. Faith Baptist has agreed to grant, and the City of Alton has agreed to accept, an initial one year easement of the property around the front gate area for the sole purpose of creating a Memorial to honor Western graduates. If at the end of that year we have been able to put in place a WMA structure, the city will accept ownership of the front gate area ensuring the legacy of our brotherhood will be safeguarded after we are gone. During a 2007 all school reunion Mike Wallis ‘63 spoke for many of us when he said, "While most of the buildings are gone there are still traces of us left on that ground-where so much happened. Where lives were fashioned, where friendships were formed, where bonds were made that will never be broken, our prints are everywhere.” Let’s take this chance to construct on the campus a reminder of Western’s Cadets. They deserve it. That is why we are calling on you now. 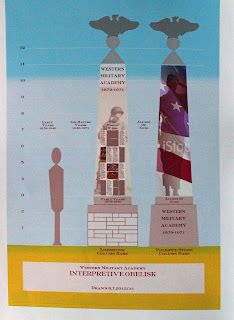 The initial phase of the memorial must be completed by June 2013 at a cost of approximately $20,000. Chuck Walker ‘49 and Richard Rook ’49 have helped jump start this effort with a generous donation of funds that remain from the WMA Scrapbook account. 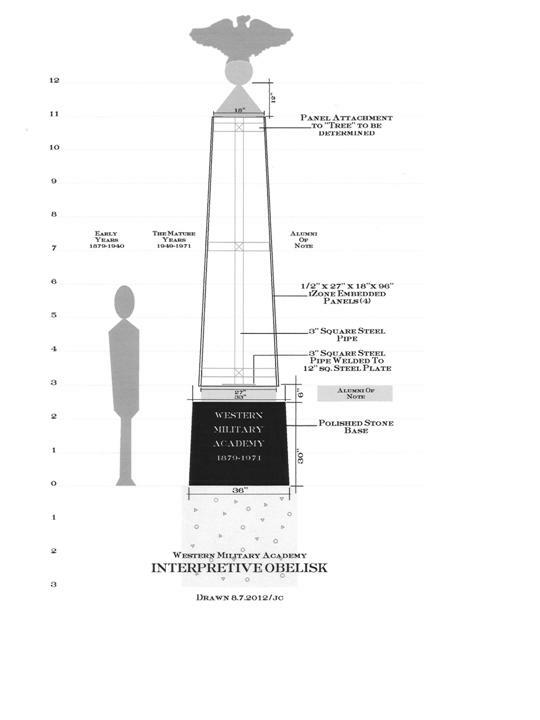 We hope you can help us toward our initial goal of constructing the permanent and concrete memorial structure. This project will be funded, in part, through tax deductible contributions to purchase personalized bricks for the Western Courtyard. Please see the enclosed order form for pricing and personalizing details. We hope to see your name in the Western Courtyard soon! The Greater Alton Community Development Association (GACD) is a nonprofit entity which will handle the funds for the WMA Project. GACD will accept tax deductible donations into their 501c (3) account. 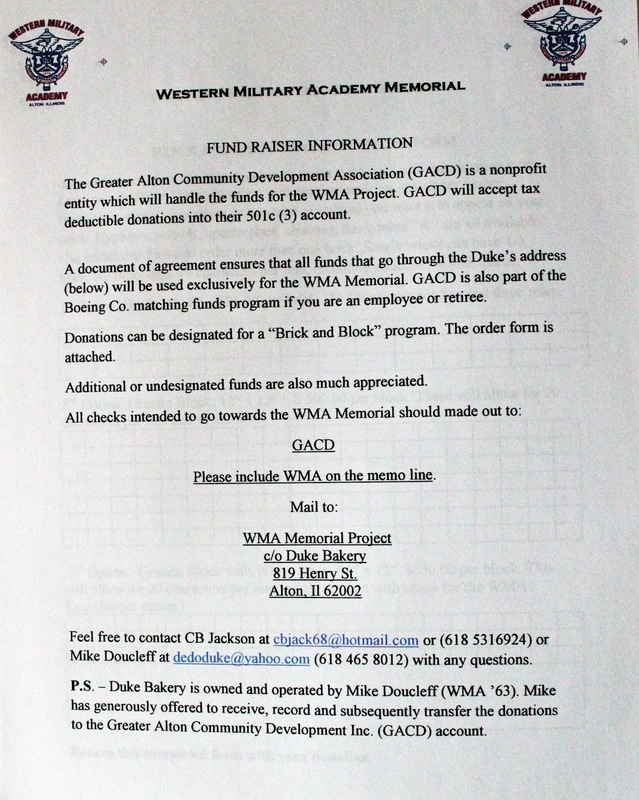 A document of agreement ensures that all funds that go through the Duke’s address (below) will be used exclusively for the WMA Memorial. GACD is also part of the Boeing Co. matching funds program if you are an employee or retiree. 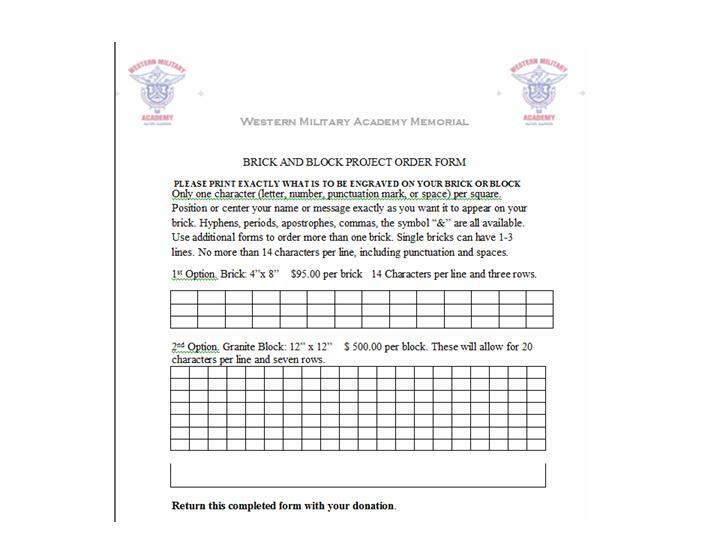 Donations can be designated for a “Brick and Block” program. 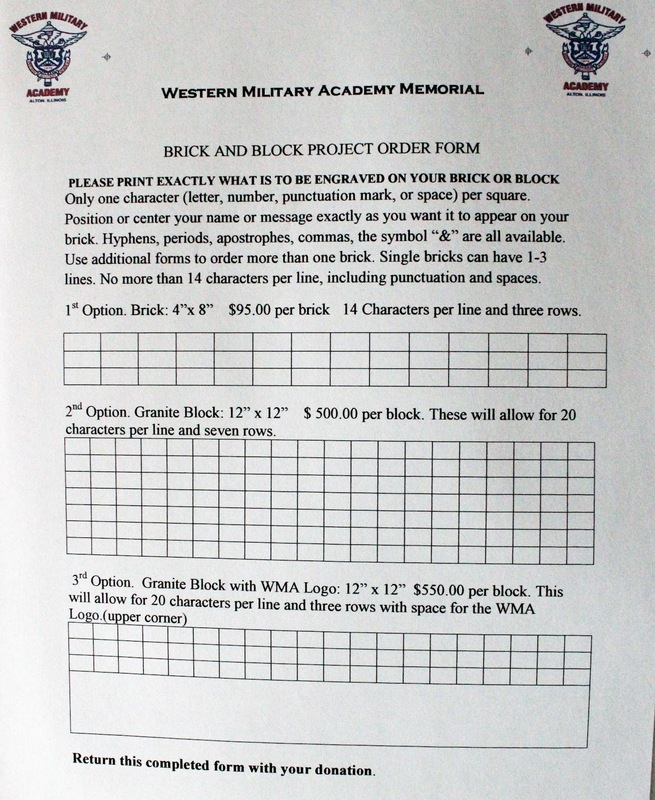 The order form is attached. Additional or undesignated funds are also much appreciated. Please include WMA on the memo line. Feel free to contact CB Jackson at cbjack68@hotmail.com or (618 5316924) or Mike Doucleff at dedoduke@yahoo.com (618 465 8012) with any questions. P.S. – Duke Bakery is owned and operated by Mike Doucleff (WMA ’63). Mike has generously offered to receive, record and subsequently transfer the donations to the Greater Alton Community Development Inc. (GACD) account. I'm not happy with this version of the software for the digital Shrapnels, but I'm tired of waiting for a better copy before I released it to the W.M.A. alumni. Here is the link my WMA Shrapnels website. It has several duplicate pages on there right now, but they are working on getting them cleaned up. I'm also having trouble with many of the search commands and some of the dates are wrong (i.e. 1979). As bad as it currently is, it is still better than nothing. I was going to wait awhile longer and release this after everything got cleaned up, but I'm simply tired of waiting. There are many interesting stories about W.M.A. grads in WW II. There are also lots of the stories about Monticello and Western from back in the mid 1930s. I hope that you will enjoy this.